The Apocalypse comes and goes and the Apostle Eli spreads the word. B efore you sit down and watch "The Book of Eli," starring Denzel Washington, put your thinking cap on and prepare for a spiritual journey across the sepia-tone ravaged land of a post-apocalyptic landscape. "The Book of Eli" is a film for those who, when given the concept of a film as a framework, and then let the film speak to your heart, mind and perhaps your soul. Denzel Washington is both producer and star, a thinly veiled attempt at telling a story of hope, amongst the hate and violence of the world. Gary Oldman plays your typical big man in a small western town. Washington delivers action, adventure, and the drama. Gary Oldman provides the tension, and the two of them provide the thrill. It is 30 years after a warhead explodes and rips a hole in the ozone layer, which allows gamma radiation onto the earth, destroying the ecology, and wiping out whole populations of humankind. As a lone walker, Eli, travels from the East to the West on a journey that is both physical yet is also spiritual in nature. Encountering the wicked along the way, Eli, armed with a machete, a pistol and a shotgun, stands as an avenging angel on the road to the west where he can deliver his precious object, a book that only Eli reads and only he can touch. The immediate survivors of the war and the radiation blast they held a pogrom against the book that they believe that started the war. The book in question, the book that started the war, the book that has started many wars is The Holy Bible. Walking on a long, lonely road, he comes upon a woman whose cries for help attracts his attention. Before coming too close Eli proclaims that without soap, one can smell their enemies over 30 feet away. It's an ambush, and a biker gang surrounds Eli. Taking on the leader, Eli warns the man that if he touches him again, Eli will not give him back his hand. The leader takes the challenge and instantly finds his hand on the ground. Ordering his gang to, "Kiss Him!” Eli explains and corrects the leader, "He's in shock, and he meant kill him." Washington is quiet throughout this movie only speaking a few words at a time, and wearing sunglasses through most of the film. Surviving the ambush by taking out about eight thugs including one with a chainsaw, Eli continues with his trek. Dialog is minimal through the first quarter of the film, Eli only speaking when spoken to, like when the woman who was acting as bait, asks him where he is going, Eli's reply is "West." Continuing his travels, Eli comes across a couple with all their earthly possessions in grocery carts. Watching the couple from afar, as another gang of thieves attacks them, chanting to himself to, "Stay the course, their problems are not his," Eli continues until he finds a town. Looking for a charge for his battery charger so he can keep his iPod alive. He strolls into a town right out of the old west. Saloon owner and mayor of the town, Carnegie (Oldman) has the ability to read, and knowledge of where the water is, he provides for the town who are essentially his slaves. As Carnegie builds towns, he is obsessed with obtaining the one book that he feels that with it, he can use it to rule the people. It is a symbol of power, and like the Catholics of the Middle Ages before the printing press, most people under 30 can't read. In that sense, Carnegie plans to use the Bible to twist the words to suit his needs. While at the saloon filling up his canteen with bartered materials, in typical barroom cinematic style, someone takes offence with him. Offering several apologies for bothering the man's cat, the biker thief gets into Eli's face and pushes the issue; Eli slams the guy's head onto the counter, telling the man that his evil deeds of robbing travelers will be accounted for. Then he takes on the rest of the bar, only stopping when Carnegie and his personal guard come have him surrounded. In typical western fashion, the Boss wants Eli to join him in his search for the lone copy of the Bible. Eli plays dumb, not acknowledge Carnegie's search for the Book; instead, Carnegie offers Eli to stay the night and sleep on the decision. Eli, like the saints of old resists the pleasures of the flesh in the form of Solara, played by that "70's Show's" Mila Kunis. Carnegie sends Solarain as a temptress to find out if he has the book or not. Blending the classic western with a biblical parable is not in itself not a new concept, however, how Denzel Washington plays this role, is more like the apostle Paul, who was blind and now can see, and charged with spreading the word of God. Eli is in the same boat. Carnegie and his men confront the departing Eli, demanding the book. Moreover, telling Eli that with the book Carnegie can rule his towns efficiently with less bloodshed. Not dissuaded by Carnegie and his men, Eli walks through the town like Eastwood or Wayne, turning his back and walking out of the town heading west, Redridge (Ray Stevenson), Carnegie's second in command, and shoots at Eli, seemingly grazing him. Carnegie screams for the rest of his thugs to shoot, they do, and a gun battle breaks out. Eli pulling his pistol, unloading rounds into his assailants, pulling his shotgun, Eli takes out the rest including firing a shotgun blast into Carnegie's leg, causing him to limp. During this battle with Carnegie, Eli wins, however, the viewer is sure that he was hit in the shoulder. A goof? Perhaps it is. Carnegie isn't the only human that Eli and Solara have found with a compromised sense of morality. George and Martha are the other two. Living in a house in the middle of the desert, the two are seemingly just an old peasant couple who live simply, are cautious, and have a horrible secret to hide. The Apostle Paul had Luke as his disciple, and Eli has Solara. As the viewer, we get glimpses of the book, and it sure looks like a Bible. On the cover, we see the cross on the front of the leather cover. The book is locked by a clasp on the side. Like the Bible itself, the lesson learned about the book is not so much what is in the book, but how much you take to heart. When Solara questions why go west, Eli explains that, after the war, a voice told him to take the book to the west and so he is doing just that. "There are things you don't question; you just take them on faith." The sepia-tone background serves its role well creating a depressing aura around the whole film. The symbolism is there for all to see, but few rarely do. 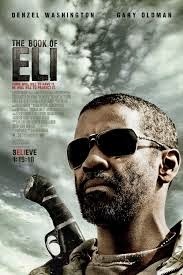 "The Book of Eli" is a message of faith, a parable of using your talents and not hiding them away. Finally, Eli is the last Apostle of God delivering his word of God to the world. Oldman, like Ahab, consumed himself with the book only to find that he is not worthy. And like Ahab the creature he obsesses over and finally attacks, attacks back wounding both his leg and his mortal should. The pacing is slow at points; however, the intrigue of the book and tension of completing the journey drives Eli, Solara, and the viewer. 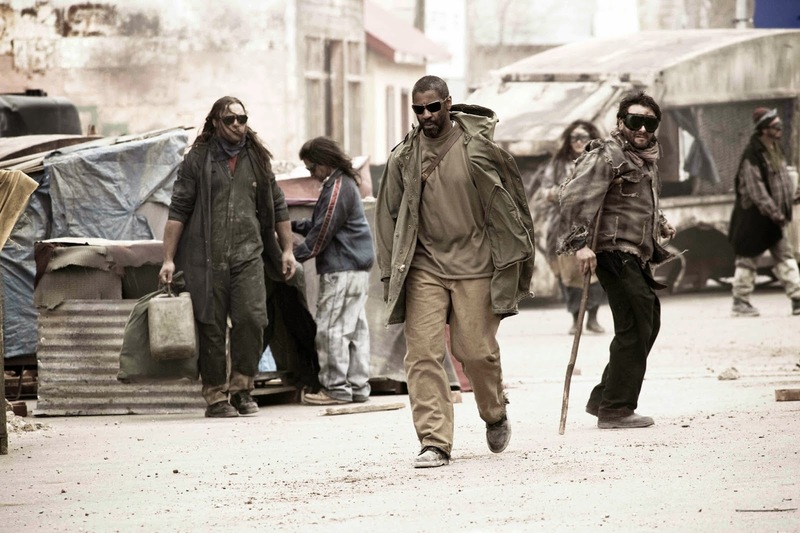 The Hughes Brothers take on deep material in "The Book of Eli," and they do a decent job of showing us a world where all there the only hope left in the world is faith. The ending is a classic "Twilight Zone."